SEOUL, South Korea -- North Korea on Friday called itself the "biggest victim" in the death of an American student who was detained for more than a year and died days after being released in a coma. 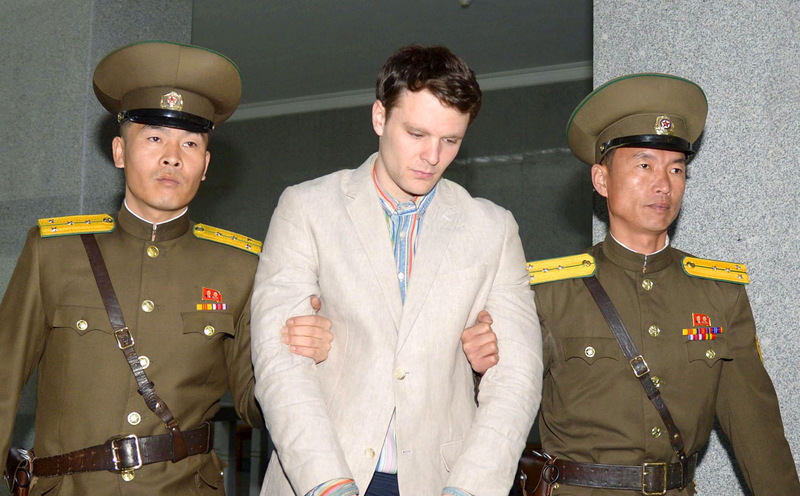 Pyongyang's official Korean Central News Agency denied that North Korea cruelly treated or tortured Otto Warmbier and accused the United States and South Korea of a smear campaign that insulted what it called its "humanitarian" treatment of him. The comments published by the agency were North Korea's first reaction to Otto Warmbier's death in a U.S. hospital Monday after it released him for what it called humanitarian reasons. Doctors at the hospital said Warmbier had suffered a severe neurological injury from an unknown cause. Relatives say they were told the 22-year-old University of Virginia student had been in a coma since shortly after he was sentenced to 15 years of hard labor in North Korea in March 2016. Warmbier was accused of stealing a propaganda poster. Through statements on KCNA, North Korea said it dealt with him according to its domestic laws and international standards. "Although we had no reason at all to show mercy to such a criminal of the enemy state, we provided him with medical treatments and care with all sincerity on humanitarian basis until his return to the U.S. ... considering that his health got worse," the agency quoted an unnamed spokesman of Pyongyang's Foreign Ministry as saying. Will Otto Warmbier's death lead to shift in North Korea policy? The spokesman also said that "groundless" speculation of torture and beatings could be refuted by American doctors who came to the North to examine Warmbier before his release and allegedly acknowledged that North Korean doctors had "brought him back alive" after his heart nearly stopped. While Pyongyang accepted U.S. demands for Warmbier's return on humanitarian grounds, Washington "totally distorted this truth and dared to clamor about 'retaliation' and 'pressure'" on "dignified" North Korea, the spokesman told KCNA. "To make it clear, we are the biggest victim of this incident and there would be no more foolish judgment than to think we do not know how to calculate gains and losses," the spokesman said. "The smear campaign against DPRK staged in the U.S. compels us to make firm determination that humanitarianism and benevolence for the enemy are a taboo and we should further sharpen the blade of law," the spokesman added, referring to North Korea by its formal name, the Democratic People's Republic of Korea. The spokesman said it was a "mystery" as to why Warmbier died days after returning home, but compared his death to the case of another American detainee, Evan Hunziker. Hunziker was detained in North Korea for months in 1996 for illegally crossing the border and committed suicide less than a month after he returned to the United States later that year. The spokesman didn't describe how Hunziker died, but claimed that the United States then "totally ignored" his death. A separate KCNA article published hours earlier also criticized South Korea for using Warmbier's case to seek the release of other detainees, including six South Korean citizens. South Korean President Moon Jae-in said in an interview with CBS television earlier this week that it was clear North Korea bears a heavy responsibility for Warmbier's death. The article said South Korea was tarnishing North Korea's image with "slanderous talk about cruel treatment and torture." It demanded that South Korea return 12 restaurant workers who defected to the South last year. South Korea said the women defected on their own, while North Korea claimed they were deceived and abducted to the South.